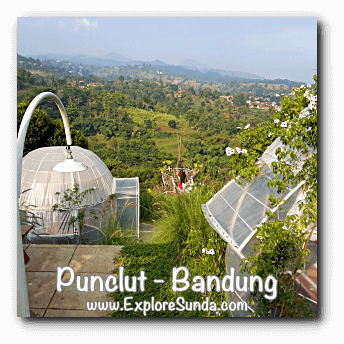 Punclut Bandung is known as a high place in the outskirt of Bandung where we can enjoy the panoramic view of the city. 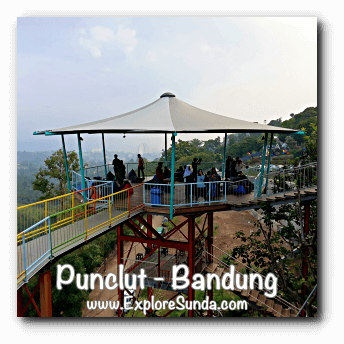 Recently, it has a new place to hang out named Kawasan Wisata Punclut. Basically, they are all restaurants So, what makes them different? D'Dieuland is a bit difficult to pronounce and even more difficult to understand the meaning since it is a combination of a couple languages! Dieu is a Sundanese word for here and D in the first character is meant to replace 'the'. 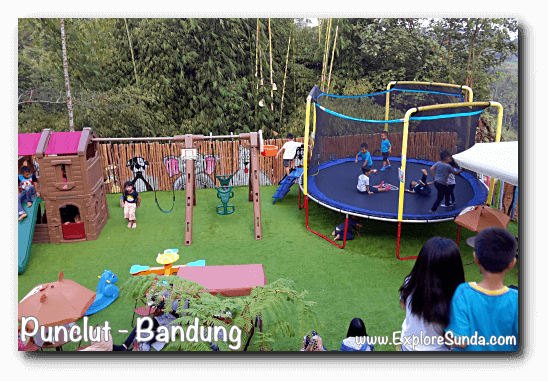 Anyway, this place has two playgrounds, the outdoor one almost at the bottom of the slope, which is closed at 6pm. The other one is indoor, which is closed when the restaurant closed. 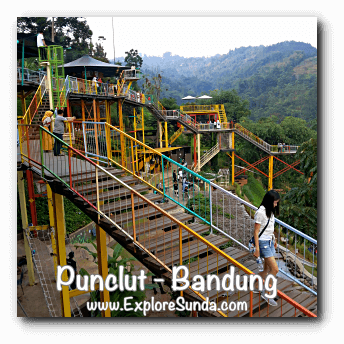 They also offer an outbound course, including walking on a plank bridge and flying fox. 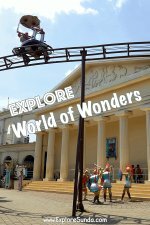 In between there are plenty of places to hang out and dine-in in the shape of stilt shacks and jumbo swings with comfortable cushions. As you can imagine, there are many bridges and many more steps to reach each site. 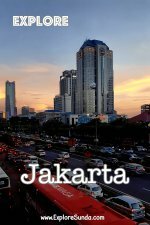 Cakrawala is Indonesian word for a horizon, which could be daytime or nighttime. So, there are two main areas in this restaurant. One has colorful glass on its roof, which is sparkling when the sun shines on it. The other one has dark ceiling with lots of tiny holes, which represents a galaxy at nighttime. The name of this restaurant is another word play. We can literally translate it from English or read it as blankon, which is a traditional Javanese hat. I believe the name refers to the latter, since most of the menu are Javanese cuisines. The name of this restaurant describe its layout: tables set up on the terracing slope. Each table is protected with transparent tent, so we don't have to worry about any sudden rain. 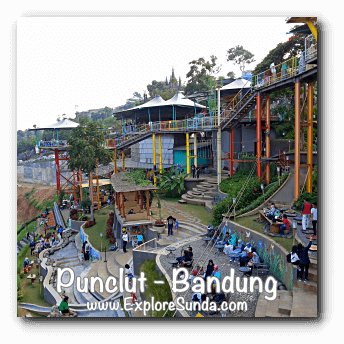 Since this place is located on a slope of a hill, walking up and down the hill as well as staircases are inevitable. So, it is not suitable for wheelchairs and strollers. Senior visitors might still enjoy the experience, although they will not be able to wander all the way down. 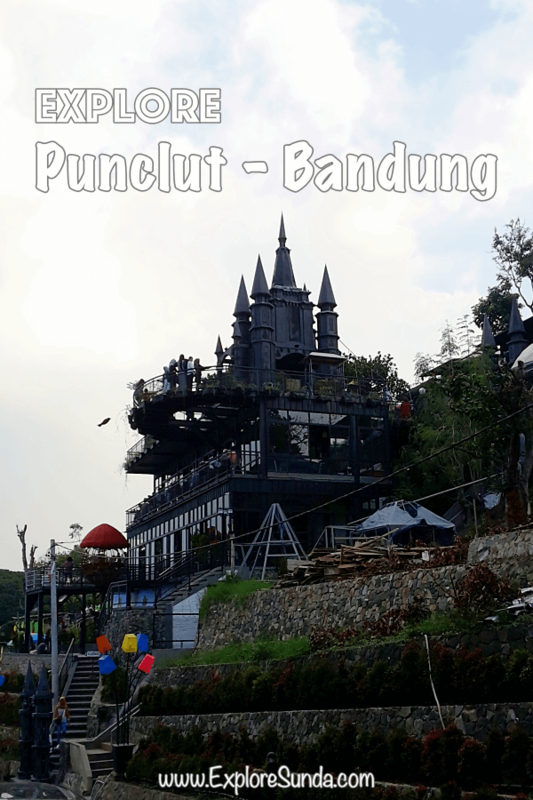 Some people refers Punclut as Puncak Ciumbuleuit (peak of Ciumbuleuit). 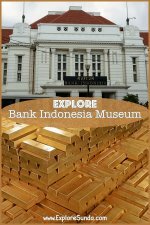 Perhaps because of its location, which is higher than Ciumbuleuit and the easiest access is through this street. 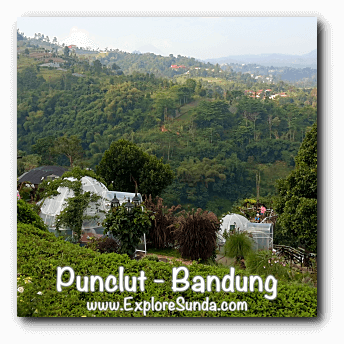 Speaking of Ciumbuleuit, I am sure non-Sundanese will have a hard time pronouncing it ;-) It might be one of the reason to shorten the name into Punclut. 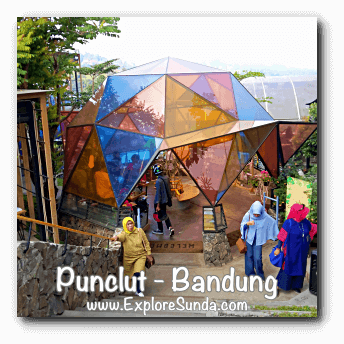 Since there are few road signs to Punclut Bandung, it might be easier to turn on your GPS map. 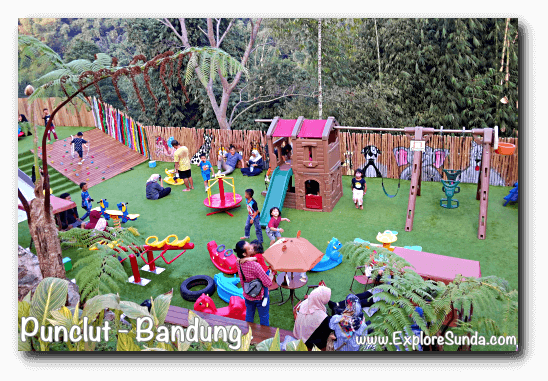 The GPS coordinate of Kawasan Wisata Punclut are 6°50'34.0"S 107°37'21.0"E (-6.842778, 107.622505). Once you are at Ciumbuleuit street, just drive straight till the end. Then, turn left and pass a hospital. The road is getting smaller here, often it is difficult for two cars passing by smoothly. 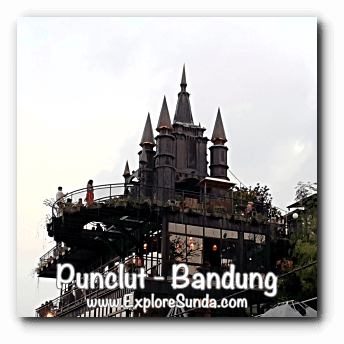 You just need to follow the road passing by several Sundanese restaurants on the right side of the road and continue straight until you reach Kawasan Wisata Punclut. It is much easier to find it during daylight. Most of the road will be dark at night, with very few street lights. 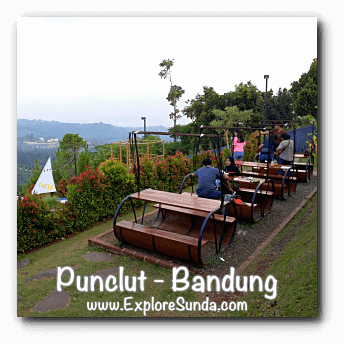 Do you know that Punclut connects Bandung with Lembang? The road is narrow, so I don't recommend you to drive through it at night.